Nonstop musical entertainment by many of Chicago’s finest cabaret performers will make “Sentimental Journeys…Musical Tours of the Heart” an unforgettable evening. 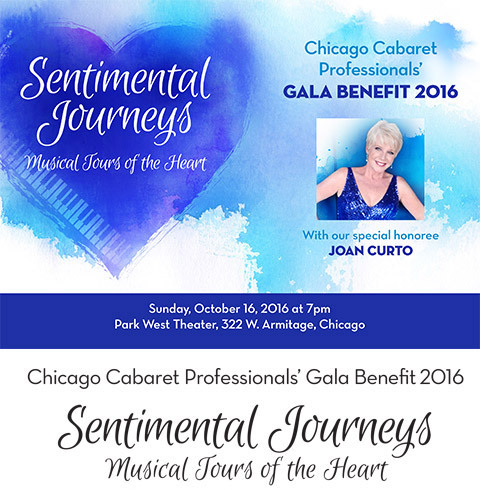 Chicago’s own nationally lauded singer/director Joan Curto will be honored at this 17th Anniversary Gala Benefit. TIME: Doors open at 5:45 pm., Cocktail show begins at 6:15 p.m., Main Show starts at 7 p.m.
MAIN SHOW at 7:00 PM, with musical direction by Beckie Menzie, featuring Anne Burnell, Mark Burnell, Cynthia Clarey, Barbara Lee Cohen, Jeff Dean, Elizabeth Doyle, David Edelfelt, Hilary Ann Feldman, Cathy Glickman, Carla Gordon, Sophie Grimm, Scott Gryder, Nan Mason, KT McCammond, Tom Michael, Bob Moreen, Paul Motondo, Daryl Nitz, Suzanne Petri, Judy Rossignuolo Rice, Johnny Rodgers, Denise Tomasello, Denise Mc Gowan Tracy, Girls Like Us (Laura Freeman, Beckie Menzie and Marianne Murphy Orland,) and Honoree Joan Curto. COCKTAIL SHOW at 6:15 with musical direction by Elizabeth Doyle, featuring Anna Besserud, Bill Dyszel, Jennifer French, Natalie Myre, Patricia Salinski, Kat Victoria, and The Boomer Babes (Pam Peterson and Jan Slavin). TICKETS: Advance sale: $60 for Reserved Table and Booth Seating; $32 for General Admission, Balcony and Bar Seating. Tickets are available at www.chicagocabaret.org, Park West Box Office at (773) 929-5959 or the CCP Hotline, (312) 409-3106. 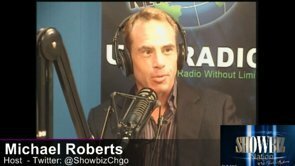 After Sept. 20, tickets are ONLY available at www.etix.com or (800) 514-ETIX (3849). Tickets at the door are $65 for Reserved Seating; $32 for General Admission. More information can be found on the Chicago Cabaret Professionals’ website, www.chicagocabaret.org. Called a “cabaret icon” by NBC news Chicago, and “an artist with clout” by the Huffington Post, CCP President Emeritus Joan Curto has appeared across the nation often celebrating the music of the Great American Songbook. She is a favorite of Chicago audiences, garnering a reputation for her thoughtful interpretations and powerful voice. Joan has performed in many Chicago theaters and clubs including: the Auditorium Theatre, The Harris Theater, The famed Empire Room, Victory Gardens, Davenports, The Drury Lane Theater, Park West, The Thorne Auditorium and the Claudia Cassidy Theater. She has been seen in numerous Chicago Humanities Festivals and the Mabel Mercer Foundation’s Cabaret Conventions. Nationally, Joan has performed in some of the top cabaret clubs and concert series including New York’s Jazz at Lincoln Center, The Metropolitan Room, The Sharon Lynne Wilson Center in Milwaukee, and The Overture Center in Madison, The Gardenia in Los Angeles and the Colony Hotel, Palm Beach.